We’ve all come across a great looking vintage clock that would be perfect — except for the fact that it no longer tells time. When this happens we have two choices: Use the stopped clock as wall decor or try to bring it back to life by replacing the movement. After having come across just such a clock myself, I decided to take a shot at repairing it myself. While I’m no expert at DIY clock repair, in the end I did manage to get my vintage clock working again even with a few hiccups along the way. 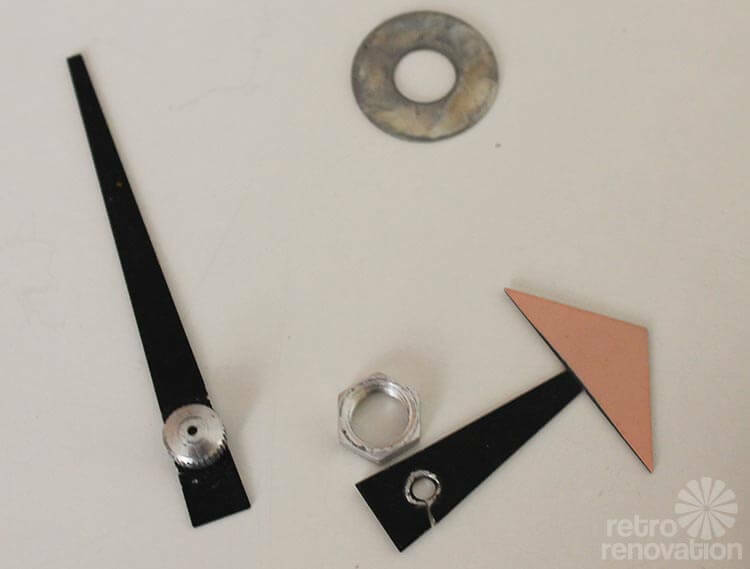 What follows is my own experience replacing the movement in a retro wall clock — in three somewhat easy steps. 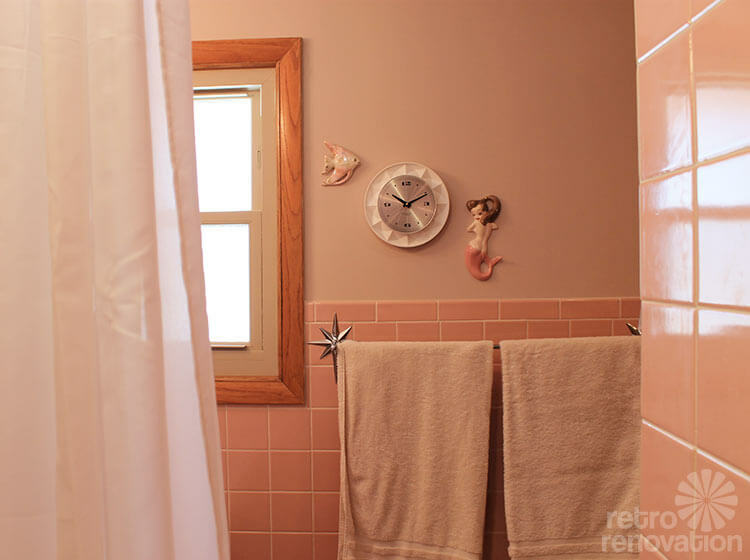 My journey into clock repair all started during my retro pink bathroom renovation project, when I purchased a vintage Westclox “nocord” from eBay to hang in my bathroom. 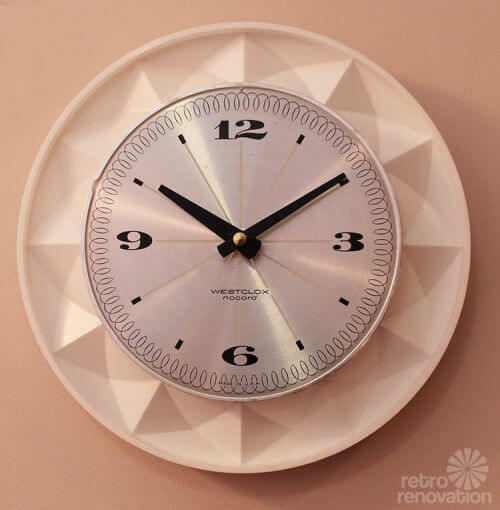 I bought the clock because I liked the interesting geometric white plastic edges and the fun retro swirly and starburst designs on the face of the clock. 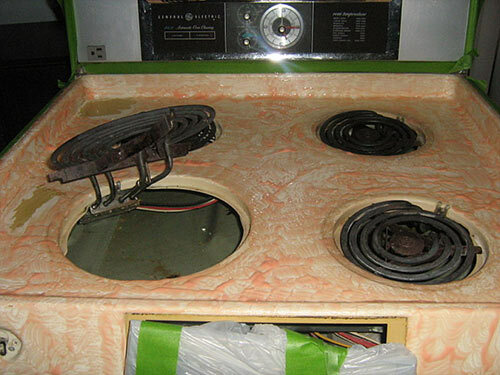 (Oops, I do not have a photo of the “before” clock.) The clock was inexpensive, and the seller said that it “worked great”, which made me think I’d only need to slap it on the wall and call it a job well done. Once I received the clock, though, I verified that it did work — though unfortunately it gained about five minutes every day, which add up fast over the course of a week. And, you can determine exactly which replacement movement is needed. Unfortunately for me, both of these tasks proved difficult. As an added challenge, I wanted to reuse the original George Nelson-style clock hands — which I knew in advance might not be possible — or, to find replacement hands as close as possible to the originals. After researching “clock movement replacement” on the web, I found that the first step was to remove the old movement. 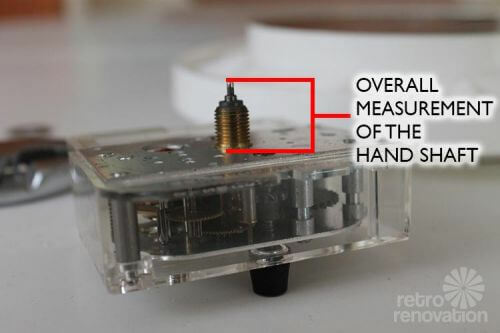 In most of what I read and saw on YouTube, the nut that holds the hands on the clock face should either pop off easily with a light, upward tug or unscrew from the clock hand shaft. First I tried unscrewing the nut, which got me nowhere because the mechanism turned as I tried to “unscrew” the nut. Next I tried to tug on the nut gently in an upwards motion. Still the cap nut would not budge. Getting frustrated, I held the “pull to start” knob on the back of the clock to hold the movement in place so it wouldn’t turn, then tried a combined unscrewing and pulling motion with the pliers. After several attempts using this method, the clock finally let go of the cap nut, which was (interestingly) connected to the minute hand. From that point the hour hand popped off easily. Then, carefully using the pliers, I was able to unscrew the hex nut from the clock face, which freed the movement from the clock body. 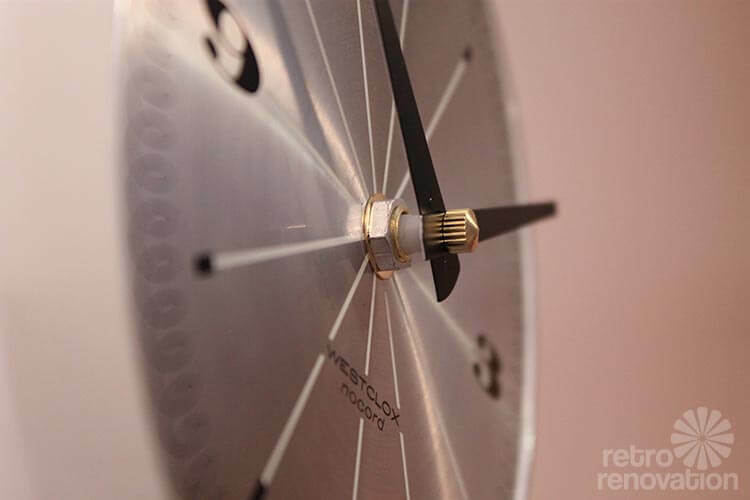 The next step is measuring the old clock movement to determine the size you’ll need when you look for a replacement. The most important part to measure is the overall measurement of the hand shaft — the part that goes through the clock face and holds the hands onto the clock. 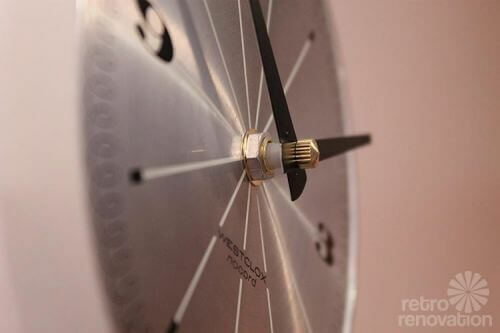 You’ll need to take into account the thickness of the clock face as well, to make sure the hand shaft will protrude far enough to be tightened to the clock face with a hex nut. 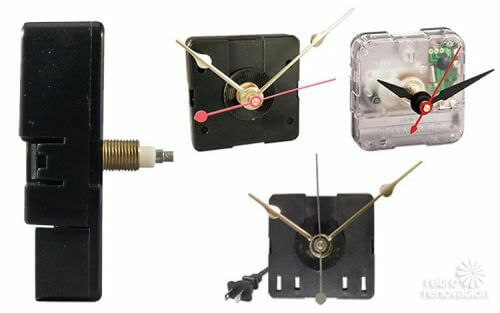 There are many places to buy replacement clock parts online — I ordered my movement from Klockit. First movement I ordered — a Quartex push-on movement with hex nut #10051 — ended up being too short for my clock. Once again, what should have been an easy task did not go according to plan. On my first attempt, I measured my hand shaft and ordered a Quartex push-on movement with hex nut with the same length hand shaft as my original movement. Unfortunately, the movement wouldn’t work in my clock. Why? First, the threaded portion of the hand shaft was not as tall as the threaded portion on the original movement. 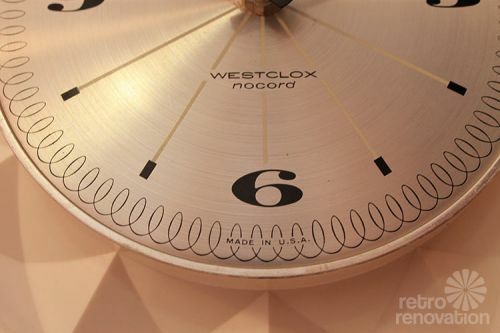 Second, because of the plastic ridge around the new movement’s hand shaft — (the original movement was flat) — and the ridge on the back of the clock face, the hand shaft would not go far enough through the clock face to be tightened with a hex nut. Bummer. 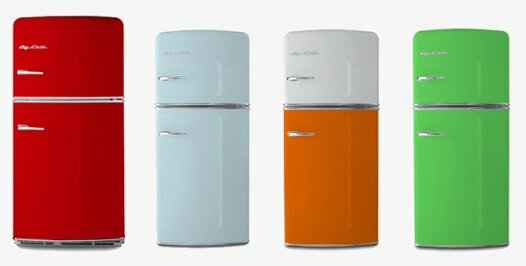 Feeling frustrated, I contacted Klockit for guidance. They replied quickly, saying I was on the right track, but just needed to order a movement with a longer hand shaft, and suggested I try their Q-80 clock movements instead of the push-on movement I first ordered. Q-80 Quartex clock movement from Klockit. I ordered part #10152 for my vintage clock. Thinking I’d give it one more shot before throwing in the towel, I ordered a Q-80 clock movement with a slightly longer hand shaft. It was apparent to me at this point that I would not be able to use the original clock hands since the holes in the original hands were much smaller than the diameter of the new movement shaft. Since Klockit offers a free set of hands with each movement they sell, I tried to find the hands that most closely resembled the originals. Of course none of the options had a large pink arrow on the hour hand like the retro originals, but I did find a set where the minute hand was nearly identical to the original minute hand. When choosing new hands, you’ll also want to make sure the length of the new hands is as close to the length of the original hands as possible to avoid using hands that are too short or too long for the face of the clock. For me, reassembling the clock — once I had the proper replacement movement — was the easiest part of the whole process. All I needed to do was follow the directions that came with the movement. I made the quick sketch above to help illustrate the process. 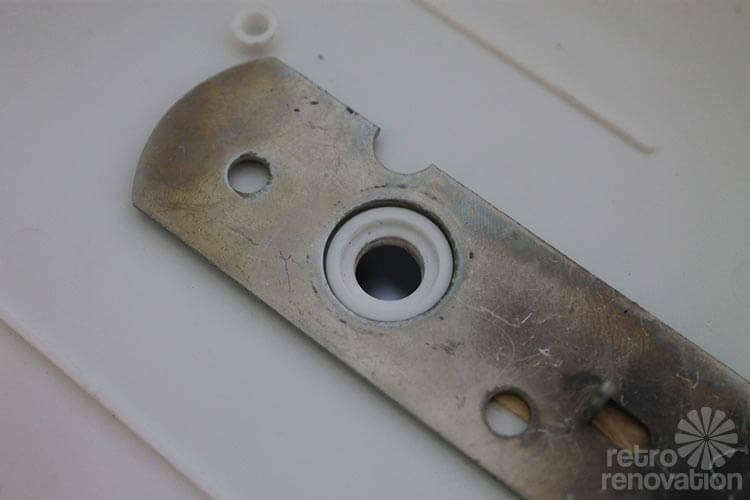 Use rubber spacer gasket between movement and dial to hold movement in position without having to over tighten it. Place a brass washer between the dial and the hex nut to prevent the nut from marring the dial as you tighten it down. Tighten the nut down only enough to hold the movement firmly in position. 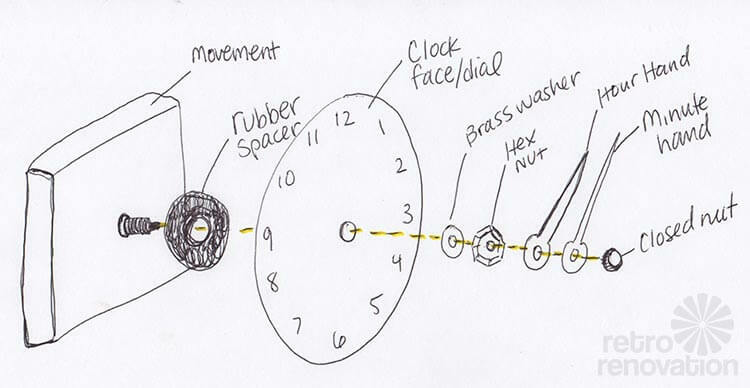 If the movement can rotate in your clock case, timekeeping will be affected. 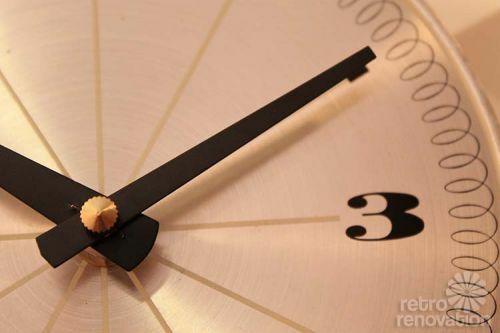 Temporarily place the minute hand over the “I” shaft as illustrated and rotate the hand clock-wise until it is pointing at the “12” on the dial. Lift the hand off. Choose any number on your dial to align the hour hand with. Very carefully press the hour hand straight down onto the tapered, friction-fit hour shaft until the hand is firmly in place. In the event that the hour hand is not perfectly aligned with the number on the dial that you have chosen, DO NOT try to rotate the hand hub on the tapered shaft. Lift the hand straight off. Realign the tip of the hand with the number and press the hand on correctly. When you have the hour hand mounted, carefully remount the minute hand at 12:00. While holding the tip of the minute hand between your thumb and forefinger at the 12:00 position, thread on the closed nut. After popping in a battery and setting the clock to the correct time, it was all systems go. I’m happy to report that the clock has been keeping perfect time since I replaced the mechanism over a week ago. As much as you will want to keep the clock’s original hands, it may not be possible. I was lucky to find a new minute hand that was nearly identical to the original minute hand. It may be possible for me to somehow make the hole in the clock’s original hour hand large enough to work with the new hand shaft on the movement, but I have not tried drilling or punching the hole to attempt to make it larger. Anyone with clock fixing experience want to verify if this is possible? All of the nuts and washers on my original clock were silver. It seems that new nuts and washers only come in brass. I was able to use the original hex nut, but for the closed nut that holds the hands in place, I could not reuse the original. The brass nut doesn’t bother me, but it could easily be spray painted silver to match. The hardest part of the whole project was trying to determine exactly which replacement movement would work with my clock. The movements were not expensive ($3-$5), but I did have to order two different movements before finding one that worked with my clock. It may be worth ordering two movements with slightly different hand shaft measurements to ensure that you get a movement that will work with your clock on the first try to avoid extra shipping charges. If you have a clock repair store near you, I would take the old clock and movement in to the store and ask for professional help in selecting a replacement movement. Figuring that part out myself was a headache! Even after all of the trials and tribulations, I’m still glad that I went to the trouble of replacing the movement on my vintage clock. 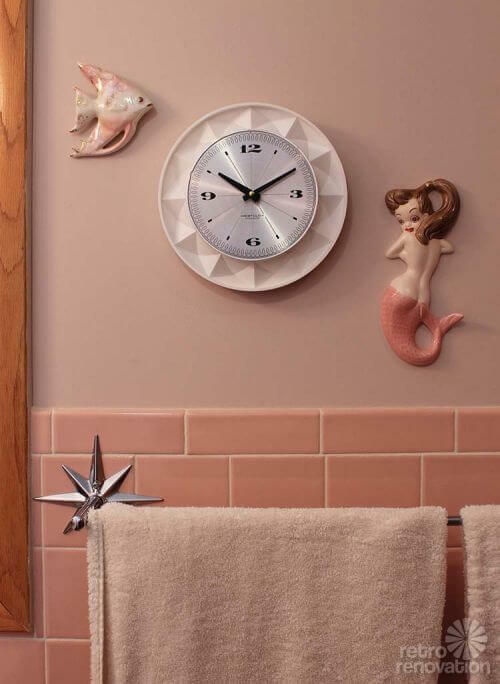 The clock looks perfect in my retro pink bathroom, flanked by some vintage fish and mermaid ceramic wall plaques, and has so much more character than a new clock would have. Now I can check the time from inside the shower — to make sure this so-not-a-morning person is not running too late. I’ve had the same problem where the old hands had holes too small for the new movement. I have successfully modified the hand holes with a set of needle files. Just have to be careful not to bend the hands or go too far. On the minute hand especially, you need to try to make an I-shaped hole to fit onto the I-shaft so the hand locks into the shaft. It’s tedious but not hard. Now if the hand holes were too big for the new movement, that would be a different story! Good Luck and thanks for the article! Speaking of clocks,I have a vintage Westclox flashing light alarm clock that I love, but in researching it I have learned that the glow in the dark paint on the hands is radioactive!I can’t find too much info about it and wondering if anyone knows anything about this? I sleep with this next to my head every night so it worries me a bit.I love the light alarm so much more than that awful ringing so I am hoping the risk is low! well, you gotta know what I am gonna say about this: Consult with a properly licensed pro. ugh! Hi again!Just wanna let you know that I have contacted three clock repair people and vintage collectors and they cannot give me a straight answer either! Online research just turns up many differing opinions on the subject.Argh! Pam – I understand your practice about “advice”, but I have to ask where I would find a licensed radiation professional, The alarm clock in question undoubtedly has a radium dial, as did virtually every wristwatch I owned in the 50’s and 60’s. 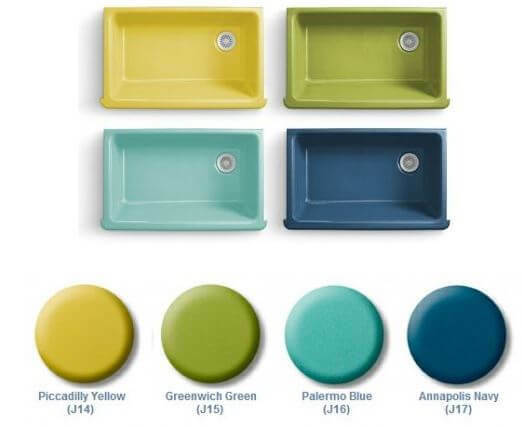 The only harm I’ve ever heard caused by this radium paint was [edited — pam says yet again: find your own properly licensed professionals to consult with when it comes to environmental and safety issues]. Bill, I do not know. MOREOVER: EVERYONE, please stop giving advice. I do not approve advice about environmental and safety issues. As you can see, you keep forcing me to edit comments. Please stop. On this one, you need to find your own properly licensed expert to consult with. Those hands can indeed be retrofit! 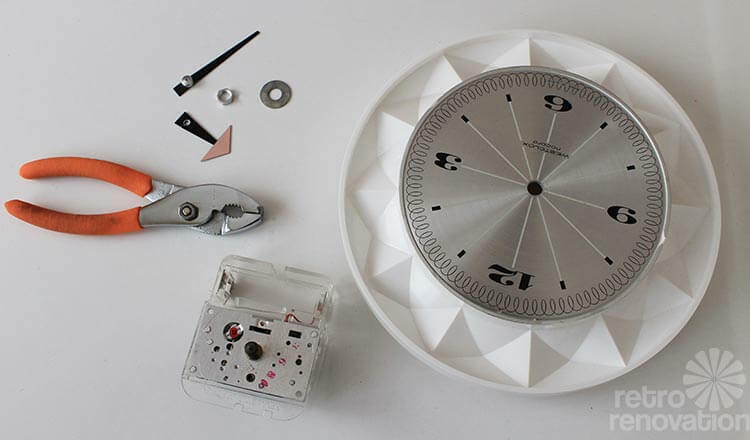 However, if the current hour hand hole is too large for the quartz clock shaft, and drilling it bigger will not help, you will need the new hour hand that came with the quartz movement. 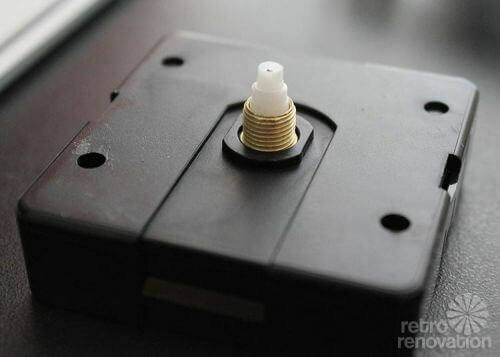 You will attach it to the back of the vintage hand using its hole as your fitting. You will only need the area of the new hand that has the hole… cut off any area that would be longer or wider than your vintage hour hand… you don’t want excess hand to show from under the vintage hand. Press the trimmed NEW quartz hour hand onto the shaft. Place a tiny drop of superglue on the exposed flat surface and place the vintage hand on top of it, over the shaft, aligning the two hands so none of the new hand shows from behind. Let it cure. The vintage MINUTE hand almost always has a smaller hole than the new quartz shaft. In some cases it will be an exact match… if so you’re all done. If not, use a Dremel with a pin-point bit to slowly shape out a new opening (the quartz minute shaft is rectangular and not round like the hour shaft). Replicate that rectangular shape until you can slide it onto the minute shaft. Thread the tiny quartz cap nut down onto it and cinch it down. If your movement came with a second hand, press it into place. I taught myself this technique and have converted at least 100 clocks to use their vintage hands. Plastic hands are a bigger challenge, but metal ones like these are comparatively easy. I had to read this a few times, but I think I understand! I know, it sounds like a lot to follow! Next time I do one I’ll send you pics and you can choose to post them if you like. I rarely use the quartz hands now, except for the hour hand as the hole section. Hi, when looking up one of my thrifting finds, I stumbled across your clock. Interesting, it appears your is missing the pink fur fringe (unless mine was custom added). Though it looks neat without the fur, cleaner nicer lines. Could you have glued the pink arrow on the new hand?